Must be the language; do Readers read? or sing? A reader (anagnostis, chtets) chants, with the exception of the Ikos at Matins, which should be read in a monotone. 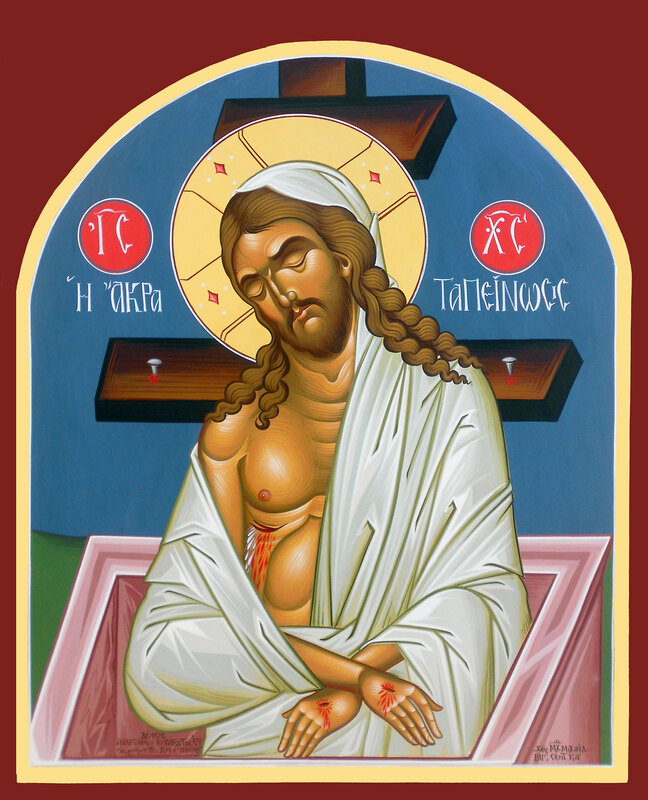 Icon painter at my church agrees with your translation, contrary to what I've heard before.....from priests. The iconographer at your parish has it right. In my long experience, those who insist icons are written are overwhelmingly converts who only speak English. Looks a bit like the Theotokos of Athos. And was created from the very similar idea. I can't see anything wrong with the LA icon as long as the Athonite is OK. There is the problem of the Native American "Christ" and "Mother of God" surrounded by mandorlas in the LA painting. I cannot clearly see what is in those circles. I assumed there are some saints associated with LA. They are not. The motif on the left is of a native mother and child, the one on the right of a native warrior. Neither are shown with haloes, yet both are surrounded by mandorlas. This imagery is at best confused, at worst syncretist. Why can't they be symbolical? 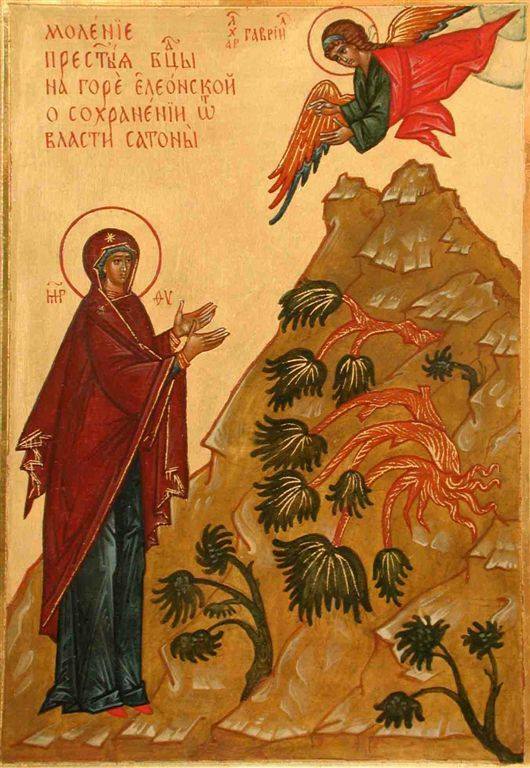 Like Kosmos on Pentecost icon? Or that old dude on Nativity one? Kosmos is surrounded by the darkness of a world not yet enlightened by the Holy Spirit. The old man talking to St Joseph is the devil, trying to plant doubt into him about the paternity of the newborn Christ. Both these symbols are spoken of in hymns and prayers, and neither bears a halo, and neither are surrounded by a mandorla of divine uncreated light. ...for the union of all, let us pray to the Lord. Wow. A synaxis of the Orthodox Churches of my home town. Most are fairly accurate visually. Which is either scary or impressive. I found the icon at Uncut Mountain Supply Icons . I'm curious as why there is a man depicted standing on top of one of the towers and conversing with an angel. If it wasn't quite so confused I would get one to pray for my hometown. All opinions expressed by myself are quite tragically my own, and not those of any other poster or wall hangings. It also leads me to want to have a Seattle/ Washington one with both St John of SF and Shanghai and the newly canonized St Sebastian Dabovich included since they each have a firm connection to churches here. Along with St Tikhon (who consecrated a now very old chapel in a nearby-ish mining town) it would be rather like a synaxis but also the cities. I mean st. Nicholas in the left corner; usually in this place in the icons presenting st. George there is Christ also in such "aureola"
It's possible that the inclusion of St Nicholas is to commemorate a family member or perhaps the person who commissioned the icon for someone called George. The usual way of doing this is to paint such saints in the borders of the icon, rather than as a medallion seen here. Here's a more typical way of commemorating family members or patrons. 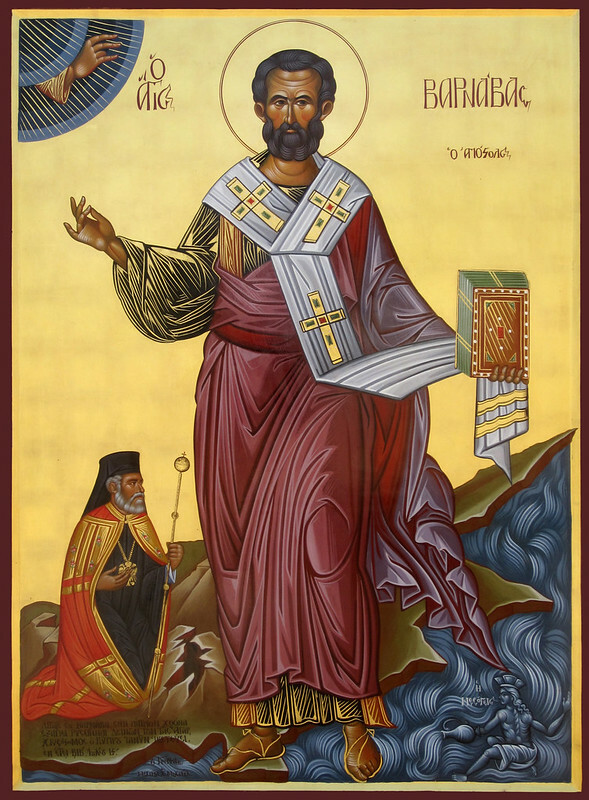 This icon of St Nikita features St Simon the Kinsman of the Lord, Venerable Evdokia, and a guardian angel in the side borders. It's likely this icon was painted for someone called Nikita, where the other saints were the patrons of either his parents or Godparents. ^^ I was going to ask you for an example So thanks And yeah, now I think that I've seen such icons (I mean with the additional patrons) like of st. Nikita you presented. Mary looks like an angry man. Yea, I thought she looked angry....stared and then she looked sad and angry.....the painter caught her hours after wherein I would have been both! So, I figure they did it right.....disturbing. Oh, and I don't see the male part of it. St. Efrosinos the Cook - does anybody have an info about him in English? 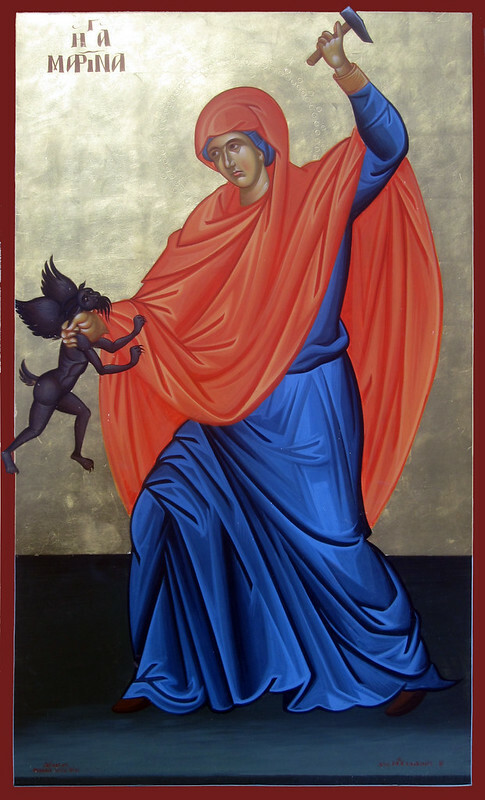 Great-martyr Marina subduing a black demon is a common sight in post-17th century icons. Some versions have her holding the demon by the horns. I'm not a fan of such portrayals, especially as they are rather late in historical appearance. The resolution of the image is too low for me to work out what the inscription is under the bishop shown next to Apostle Barnabas. He might be the patron who commissioned the icon, or a bishop of Cyprus. The land mass that St Barnabas is standing on has the shape of the island that is Cyprus, of which he is a patron, having served there as its first archbishop. You're right, this is the first time I've seen Christ wrapped in such a cloth in this type of icon. It is probably an attempt to show him in a burial shroud. Saint Euphrosynus the Cook was from one of the Palestinian monasteries, and his obedience was to work in the kitchen as a cook. Toiling away for the brethren, St Euphrosynus did not absent himself from thought about God, but rather dwelt in prayer and fasting. He remembered always that obedience is the first duty of a monk, and therefore he was obedient to the elder brethren. The patience of the saint was amazing: they often reproached him, but he made no complaint and endured every unpleasantness. St Euphrosynus pleased the Lord by his inner virtue which he concealed from people, and the Lord Himself revealed to the monastic brethren the spiritual heights of their unassuming fellow-monk. One of the priests of the monastery prayed and asked the Lord to show him the blessings prepared for the righteous in the age to come. The priest saw in a dream what Paradise is like, and he contemplated its inexplicable beauty with fear and with joy. He also saw there a monk of his monastery, the cook Euphrosynus. Amazed at this encounter, the presbyter asked Euphrosynus, how he came to be there. The saint answered that he was in Paradise through the great mercy of God. The priest again asked whether Euphrosynus would be able to give him something from the surrounding beauty. St Euphrosynus suggested to the priest to take whatever he wished, and so the priest pointed to three luscious apples growing in the garden of Paradise. The monk picked the three apples, wrapped them in a cloth, and gave them to his companion. The priest related everything to the monastery brethren, pointing out the spiritual loftiness of Euphrosynus in pleasing God, and he pointed to the fragrant paradaisical fruit. Deeply affected by what they heard, the monks went to the kitchen, in order to pay respect to St Euphrosynus, but they did not find him there. Fleeing human glory, the monk had left the monastery. The place where he concealed himself remained unknown, but the monks always remembered that their monastic brother St Euphrosynus had come upon Paradise, and that they in being saved, through the mercy of God would meet him there. They reverently kept and distributed pieces of the apples from Paradise for blessing and for healing. 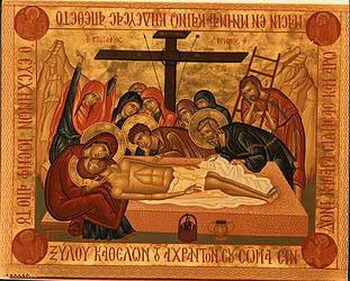 I know these icons are Coptic, but generally we (EO) have very similar canons. 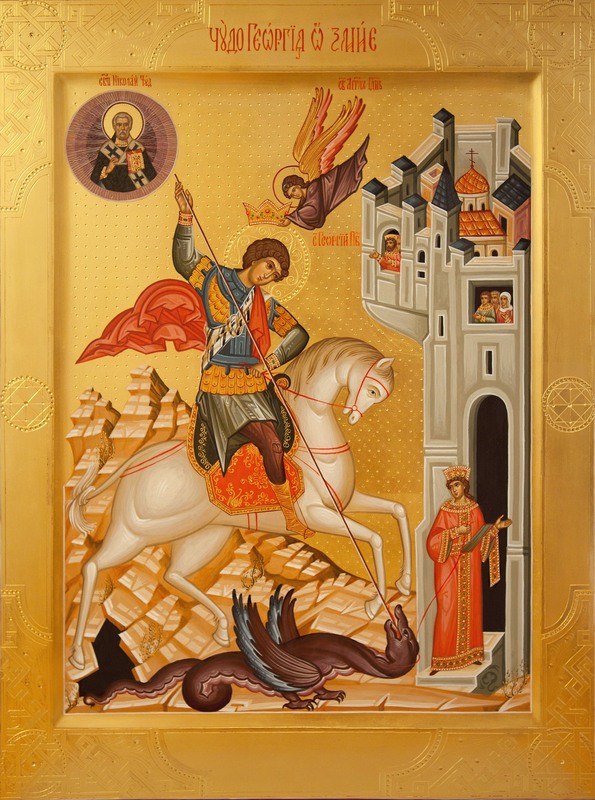 This is an icon of St George (I think?) in "batik", found by a friend at an antique store. Does anyone know anything about it? Age? Place of origin? Etc. 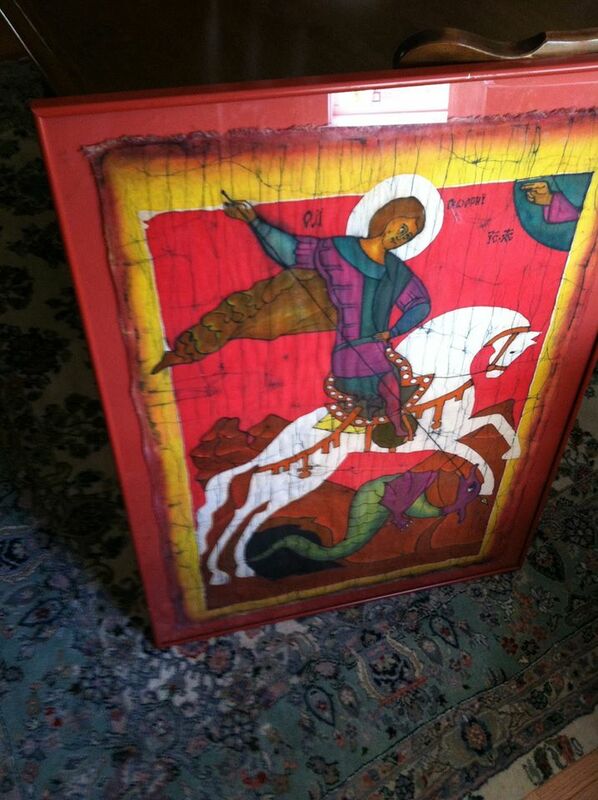 It is a famous one of St George, from Novgorod, Russia, painted in the late 14th century. It's an icon of Joshua, son of Nun. I suspect the bulk of the inscription is either OT scripture relating to him, or derived from it, but the cropping of the original mural icon has removed some of the text. That's interesting. I like it. I really like this: both the icon and the subject. Who is the saint on the left? Thanks for the hagiography of St. Efrosinos the Cook. For some strange reason I always thought he was holding an onion. Buy was I wrong. I see his icon quite a bit in local businesses. I find it comforting. The inscription reads: The Mother of God praying at the Mount of Olives for protection against the power of Satan. The angel shown is Archangel Gabriel. The image looks like a panel from a "life" icon, which has a central depiction of a saint, surrounded by small panels depicting aspects of their life. The assembly of angels and the race of men. O sanctified Temple and rational Paradise! O glory of virgins! From you, God was incarnate and became a child, our God before the ages. He made your body into a throne, and your womb He made more spacious than the heavens. All of creation rejoices in you, Lady full of grace, glory to you. 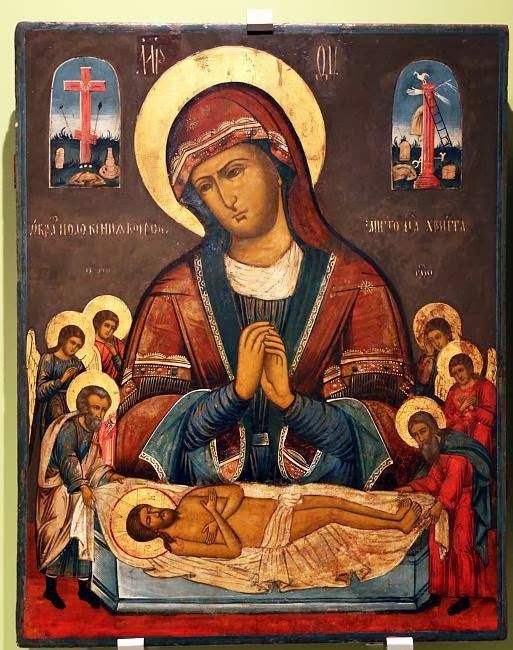 The version Dominika has posted is simplified compared to most other compositions, but retains some of the features distinctive to this icon type: the magi presenting their gifts to the enthroned Mother and Child, the assembly of angels, and things of earth such as hills and vegetation. The two haloed saints in the lower half are St John of Damascus on the left, and St Kosmas of Maiuma, iconographers who wrote a great number of hymns to the Mother of God. Yes it's indeed Joshua of Naue, a mosaic on the exterior wall of the Katholikon of the Monastery of Hosios Loukas in Boeotia, Greece. Interestingly enough, the warrior's armor he is depicted wearing, is the Byzantine typical equipment of a heavily armed infantryman of the 10th-12th c.
Πρῶτος παρ'ἡμῶν εὐλογείσθω τοῖς λόγοις. Πρωτεῖα νίκης πανταχοῦ πάντων ἔχεις.